To have the kind of personality that is imbedded in Steve Irwin's psyche is to wrestle with death on a daily basis. The notorious and audacious "Crocodile Hunter," as he is known on his Animal Planet series, is the kind of spirited by troublesome guy that most of our parents warned us about when we were young: the seemingly insane individual who always acted on impulse but never thought about the potential consequences until it was too late. On a weekly basis, Irwin, along with his wife, descends perilously into the murky habitats of wildlife, exploring creatures and their characteristics so thoroughly and profusely that their own lives are sometimes placed on the line. His passion for nature is also a personal war, and though it's hard not to be charmed by the guy's crazy and sometimes hilarious methods, it's also hard not to wonder if he's ever suffered some kind of brain damage. 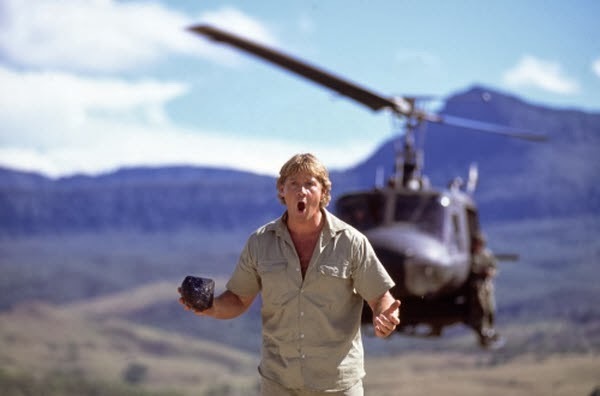 Having said that, "The Crocodile Hunter: Collision Course" immediately begins to work as a major movie concept. What one will see on screen won't be some fabricated reenactment of some past deadly encounter with gigantic snakes or spiders, but live, unrehearsed and authentic stuff, with Irwin himself dancing the line between safety and injury more often than he seems to realize. But those who have any ounce of admiration for this larger-than-life personality will constantly find themselves at war with a rather annoying little trait that the movie carries: the plot. In star vehicles that demand the stars to simply be themselves, any story is bound to exist simply as a platform for the true merits, but when its focus begins to detract from what the audience is truly there for, then the endeavor is undermined. Irwin is a man with enough charisma and audacity to carry a dozen films, but this particular result is ultimately held back from being something greater. The "plot," or whatever you want to call it, some kind of orbital beacon that falls to earth when a space satellite explodes and sends projectiles flying in all directions. The beacon is tracked by the US government when it reaches land, but there's one major drawback: this crucial item that must be retrieved is swallowed by a crocodile, whom Irwin and his wife have been asked to relocate into a new area. Fearing that these croc hunters know of the beacon and are trying to swipe it away for themselves, the officials send two of their experts into the area to apprehend the duo and retrieve the artifact (at one point, the movie even suggests that the CIA is dumb enough to consider these two as major international geniuses). Needless to say, Irwin and his wife are completely clueless to the identities of these people and what they're looking for, and as the movie progresses from one antic to the next, they draw the conclusion that the two are actually croc poachers. Being the man that he is, Steve isn't about to let two men touch his precious reptile. When the movie isn't concerned with all of this passive mumbo-jumbo, it's actually quite engaging. Steve often pushes his nerves to the breaking point by going head-to-toe with deadly creatures like poisonous snakes and large deadly spiders, talking directly to the audience during it all as if it's part of a documentary (although there's never an indication that a camera crew is around filming anything). Even more puzzling is how the man is able to retain any kind of sense of humor while he's involved in this kind of dangerous stuff; sometimes the information he relays comes with cheap shots at himself, such as a moment when he paints the scenario of what it would be like if a snake whose venom can decay body parts bit him in the crotch area. This is where the heart of the movie, and the effort, is all at; no one cares about the bonus characters, the subplots, the meandering or the resolution. It's Steve's movie plain and simple, and when he's there, he lights us up. I never thought too much of Irwin's approach as anything unique in the very beginning, to be honest; after all, don't people in the profession put themselves on the line one time or another to get that important camera shot? As time went on and his shenanigans got even more insane and disturbing, however, he began to win this skeptic over, earning admiration and respect even when his own sanity seemed to be flying farther out the window. There is a great moment in "The Crocodile Hunter: Collision Course" that clearly demonstrates what lengths that Steve is now willing to go to with dangerous animals; it involves him going toe-to-toe with (get this!) a bird-eating spider, him nervously shaking his hands as he attempts to balance the arachnid without having it turn around on him and unleash its fury. Now we see what truly fuels his desires: his balls must bigger than the spiders.